This one, I thought, was going to be a toughie. But alas, I’ve managed to round up a few reallllly cute gift ideas all on the general theme of mail and brown paper packages, as we continue on our quest to find gift ideas tied into the classic tune, My Favourite Things. If, like me, you simply squee in delight at the prospect of all things tiny, then you’ll definitely get a kick out of this first idea. Choose from one of sixteen pre-spec’d mini messages & prizes – like ‘You put a bounce in my step’ to be delivered alongside a rubber ball, or a tiny pear ornament with a sweet congratulatory message ‘You two are a perfect pair’ – or create your own combo. The wizards at Leafcutter Designs will take craft your custom package and mail it out to the special someone of your choosing. Not only will they get ‘fun’ mail, they’ll get gosh darn ‘cute’ mail. Who knew such a thing existed? Sure it’s not ‘brown paper packages’ per se, but given that I’m only trying to channel the general vibe of the lyric – hello romantic snail mail – I felt these beautiful little bags were completely apropos. Both bags are by design outfit Disaster Designs, and both harken back to a simpler, sweeter time when it was commonplace to get lightly scented love letters or desperate bids via the mailbox. Go for a slightly girlier, gentle take with the pretty Through The Post clutch for a night out with the girls, or show off your globetrotter sense of style when you haul out this slightly Parisian wallet to pay for those cosmos. And the literal take again. I love the idea of one-of-a-kind wrapping paper, the type that speaks to your giftee’s persona. Talented artist Amiee Bowker actually sells a dozen varieties, each featuring a different animal motif for a truly rustic, artisanal feel. Use it to wrap up a box of your best friend’s favourite gourmet treats from the Farmer’s Market, or to deliver a box of cookies to a friend that’s under the weather. See if you can save the paper and frame it for an abstract tiled print. 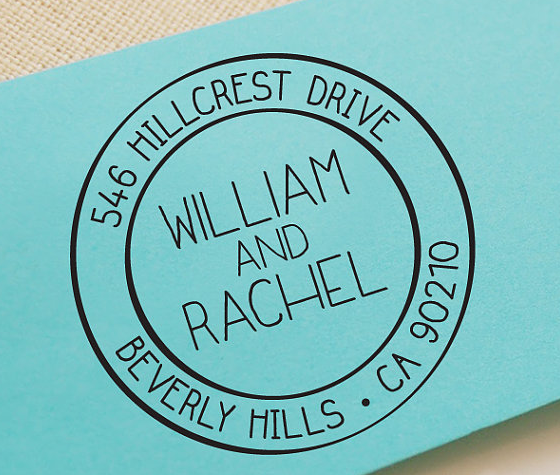 Truth be told there are dozens of custom return address stamp makers on Etsy, just do a search for ’em. I was drawn to the simplicity of this one because it also reminded me of a vintage postmark. What’s particularly cool about this one is it’s already prefilled with ink, meaning you can (with proper care) get thousands of imprints before needing to replace it. When is this a perfect gift? For your newly engaged pals that’ll soon be sending out invites and thank you cards galore, for your crafty scrapbooking mom that loves to send out her own handmade greeting cards at Christmas and other holidays, or simply for that friend that’s picked up a beautiful set of stationery and needs a perfect bit of polish to finish things off. A package can most certainly be the thing you walk away with when attending a fete for a friend – after all, who doesn’t love a goodie bag? 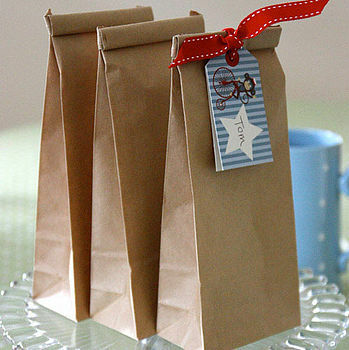 If you’re throwing a shower with a DIY theme or a kid’s birthday party, go old school with these petite snack sacks, accented with a grosgrain ribbon and a gift tag (both of which are available through the same seller). Leave some crayons or markers out so guests can decorate their bag beforehand, and let them stock up from a candy bar or trinket box for a 2-in-1 activity. 1) Leave a comment by April 1st with your favourite ‘Brown Paper Packages’ gift idea featured in this post. 2) Entries are limited to one per person / per email address / per household (or more if you score bonus entries). A random draw will be conducted on or around April 1st to select the winners, who will have 48 hours to respond before another winner is chosen in their place. 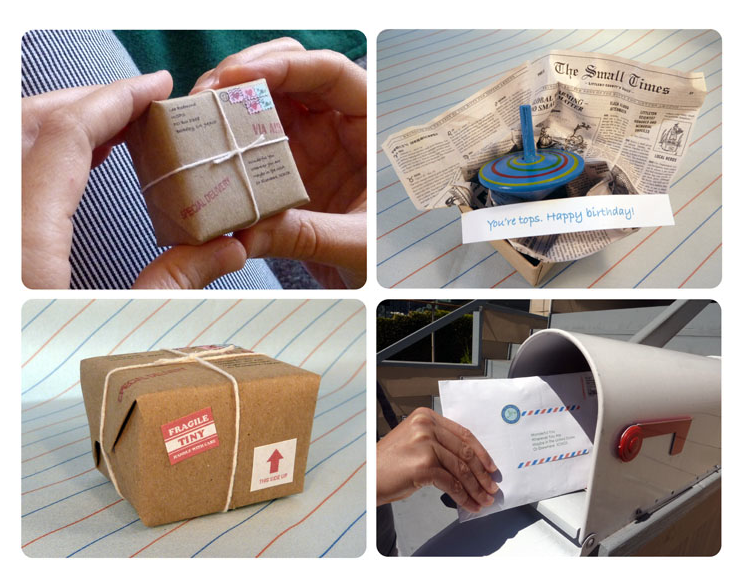 4) Bonus Entry: The Leafcutter Designs FB Page & Twitter feed are amazing sources for DIY inspiration and craftiness. Like ’em both, leave a comment / send a Tweet, and leave a comment back here linking to your Tweet / Comment (and / or include your username) to earn two bonus entries. I like the Hand Printed Giftwrap – very neat idea! I like the thoughful gifts in tiny packages. Great idea. Love them all, especially the custom return address stamp. I really love the personalized return address stamp! LOVE the handprinted gift wrap. I have a thing for owls. My favourite one from your list is the Custom Return Address Stamp. Love it!! The Handprinted Gift Wrap is truly artwork. Oh my goodness! Love the ModCloth pretty clutch and wallet, so original! I’m totally going to pick up one (maybe both) of the ModCloth goodies! Love them & the Tiny Packages are just adorable! Love the Cute as a Button & the Where Would I be Without You designs!! I would love the Custom Return Address Stamp for when I do my homemade, scrapbook Christmas and birthday cards! Thank you! Love the custom return stamp. I really like the custom return address stamp. What a great idea! So creative! 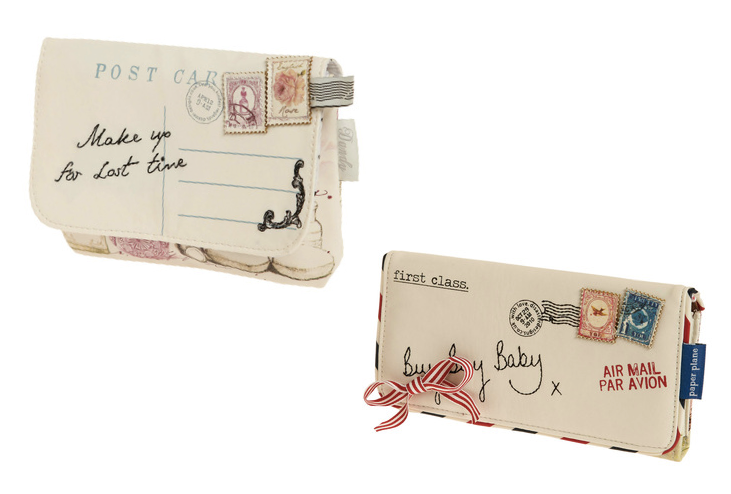 love the “keep you posted wallet” but it was hard to choose, all so cute !! While the return address stamp seems to be the longest lasting item, I just don’t send mail much any more. That said, the Thoughtful Gifts in Tiny Packages, could be a long lasting (brownie points) item too! I love all the ideas but have to say my favourite is the Through the Post clutch from modcloth! Super cute! The postal wallet & clutch are both adorbs. i think the Custom Return Address Stamp would be a great house warming present too! the hand printed gift wrap is really nice! Through the post clutch – it’s so cute! I like the return address stamp. That’s useful. I liked the post cluth and keep you posted wallet, very different and practical. Thank you for this contest!! Entered on facebook and twitter, facebook and twitter id is jazzy005 liked both. I like the the posted wallet. Love the address stamp, and the tiny packages! I really like the handpainted gift wrap!! I think the Top is the cutest idea ever! I love everything about this idea. I love minatures. Love the custom return address stamp! My favourite ‘Brown Paper Packages’ gift idea featured in this post is the “Thoughtful Gifts in Tiny Packages – $11 @ Leafcutter designs (+$7 shipping)”. So adorable, luv it! I love the Through The Post Clutch & Keep You Posted Wallet. Really unique! What wonderful ideas they have. I really like the Custom Return Address Stamp, that is so cool. Keep You Posted wallet. Pretty cool! 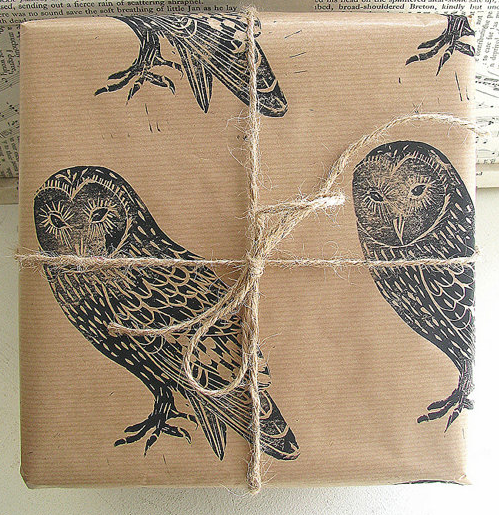 The hand printed gift wrap is lovely!